“Claims of stagnant wages and job insecurity simply don’t reflect the facts. There is only one explanation for the ACTU’s grievances – they are struggling to be relevant,” Australian Chamber CEO, James Pearson, said today. “The reality is the key driver of wages growth is increased productivity, and the Australian experience is that employees and employers understand the best way to achieve this is by working together. “With only 9% of Australian private sector employees choosing to join a union (38% of the public service are members), the union business model doesn’t stack up. “The union movement wants there to be conflict in the workplace because they believe it will help them to recruit members – regardless of whether that conflict is warranted. “Australia by nature is an optimistic and united country and our economy is developing rapidly as businesses work hard to stay competitive in a changing world. Australia has the second highest Minimum Wages in the world. Just 1.9% of Australian employees are paid the National Minimum Wage. 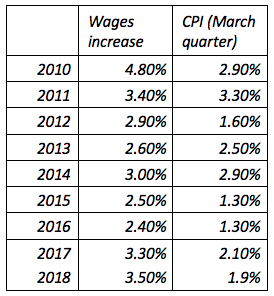 The past NINE annual minimum wage increases have been ABOVE inflation. Over half of Australia’s small business owners are paid less than $50,000. Small businesses account for over a third of minimum award wage employment. Self-employment (eg. tradies) is stable. Penalty rates are NOT being abolished. In 2010, there was a flat $26 increase, which took the minimum wage from $543.90  to $569.90.